Grain growers in the southern cropping region whose crop yields were limited by this year’s dry conditions could be in a position to reduce input costs next season. Growers are advised to test their soils ahead of sowing in 2016 to determine whether an opportunity exists to adjust fertiliser inputs, especially phosphorus (P). Dr Rob Norton from the International Plant Nutrition Institute says that in non-calcareous soils, less of the P applied in a dry year will be immobilised than in a normal year. “In calcareous soils though, the P losses through fixation are probably not greatly affected,” Dr Norton said. Speaking at Grains Research and Development Corporation (GRDC) grains research Updates, Dr Norton said it was important for growers to identify the P status “starting position” going into the next cropping season, and soil testing was the most obvious and reliable way to do that. “The best way to find out if P is running down on a farm is to soil test and then assess if the program needs to build or rebuild fertility using P rates above removal, or if at maintenance, use P rates around long-term removal,” Dr Norton said. “Key message number one is to take a good sample, and for P, depth is critical as most P is in the top soil. Dr Norton said that getting P right at seeding set the foundation for good early vigour, and as yet, there were no proven in-crop P interventions that could make up for early deficiencies. “Research over the years has been clear that the right time and the right place for P is near the seed as it germinates and emerges. Dr Norton said soil moisture status influenced rooting patterns and so under dry conditions, P acquisition particularly was more reliant on banded fertiliser P rather than P from the bulk soil. Although many cereal crops were cut for hay in the southern cropping region this year, Dr Norton said P removal would have still occurred to some extent. “Cereal hay removes around 1 kilogram of P/hectare/tonne, while grain removes around 2.5 kg P/ha/t, and canola hay removes around 3 kg P/ha/t. 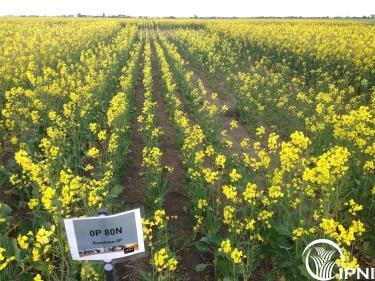 Dr Norton said there was nearly always a benefit to having some P in the seed row, and rates of 3-5 kg P/ha should be considered as the bottom line. “Lower rates are likely to be less evenly distributed, and therefore, give poor results. “For example, on 25 cm row widths, supplying 2 kg P/ha would mean that on average, granules are between 8 and 12 cm apart, depending on the product in the drill row. More information on phosphorus management is contained in a GRDC Fact Sheet which can be viewed and downloaded by selecting the icon GRDC P Management under related content in the left column.